The words were just typed into a chat box, but I felt a hesitation, the cringe of negative expectation, just as clearly as if she’d been sitting next to me, looking me in the eye. I typed the words back, because I wanted them to have that written-word-weight, but also looked up into the camera so she could see my sincerity. She needed to see my sincerity. “I don’t judge you,” I reiterated. I meant it, just as much as the first time I said it. I was doing a video/chat Tarot reading, and set about answering her questions as best I could, leaving aside the morality concerns. She didn’t need my help with the morality issues, no doubt already having had many sleepless nights to struggle with that herself. She was looking for perspective and information on where circumstances currently sat, and I did my best to give exactly that to her. This isn’t to say I’m a fan of extra-marital affairs. I certainly don’t want any in my personal life! It just means that I am not the keeper of anyone else’s path. I don’t know why a person is where they are. I don’t know where their own path is leading and what is “bad” to me may well be a part of their own journey. I don’t know about the marriage or about the affair or about the people involved or what brought them to where they are right now. Just because I’m a reader doesn’t mean I’m omnipotent. I don’t ever forget that fact. But more importantly, I’m not here to determine right and wrong for anyone else. I don’t want the karma! Yes, there are circumstances I don’t think I could put aside well enough to effectively consult. Murder or exploitation of children come to mind as a couple of examples. I could never be objective. There are also some acts for which I will not be a participant because I don’t feel right or good about doing so–every time I’ve ever tried to fudge even a little on what I feel good about, it’s cost me. So if you’re looking to “psychic spy” on your ex, I am not the Tarot Diva for you! But just because you make different decisions than I would in general doesn’t give me the right to look down upon you. There is always a balance to be struck, between encouraging others to reach for what I perceive to be higher, more positive expressions of energy, versus being convinced I as just a humble Tarot chick have the right to make those calls for everyone else on the planet. So yeah. If I don’t feel good about what I’m trying to do with our work together, I won’t do it. But you’re free to live your own life regardless, without me sending disapproving vibes or spouting moral imperatives and declarations of ultimate righteousness at you. To me, the point is living righteously, not preaching it. I believe living righteously is the most meaningful way of preaching it anyway. What’s your take on readers judging clients? Glasses at top of photo to show size. I’m always looking to learn something new about the cards, and a book I picked up a few months back has been a goldmine in that regard: [amazon_link id=”0980409934″ target=”_blank” container=”” container_class=”” ]Tarosophy[/amazon_link] by Marcus Katz. One of the exercises I’m particularly excited about trying: “Living the Archtypes” (pg 49). Using Major Arcana only, you take out one card at a time, put it in a prominent place, and just wait. Periodically reflect and meditate on the card, but leave it out and in your line of sight until the card speaks to you, something in your everyday life personifying that card’s energy. If you have to ask, “Is this it?” it isn’t! Doing this for the entire major arcana, Katz says you can expect it to take anywhere from 6 to 18 months to complete the cycle. He suggests skipping the Fool, as the exercise itself serves that energy, but my Virgo doesn’t like to leave the Fool out. He also notes the method of communication will suit the card’s energy. E.g. the High Priestess won’t be as direct as, say the Emperor. 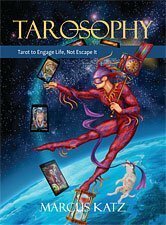 The idea here is getting to know the Tarot better by life experience. I just got Cathy McClelland’s gorgeous Star Tarot, a majors-only deck for this exercise. The cards are delightfully huge at 4 1/2″ by 6 1/2″, so great for this kind of use. I plan to frame the cards as I complete each in the exercise. Has anyone else done this type of exercise? Anybody want to join me? I’ve had to give a few very scratchy readings recently. These are rather hard to give but I’ve no doubt, much harder to receive. I do feel bad doing them, even when I’m handing over stark declarations. Never think for a moment it’s done cavalierly. I have learned not to censor, although I won’t say I am never tempted to put on a sweeter spin, pull back, especially if I’m not sure. But I try to overcome that temptation, because I know it doesn’t serve. Every single time I’ve given in without exception, I’ve regretted doing so. I believe I get what I get for a reason. I believe the people who are drawn to work with me are so drawn for a reason. That’s the deal. I mean, how can you do this kind of work and NOT have faith around you’re doing, you know? I can say people often seem most grateful for the scratchy readings. Not always, but often. Probably because it’s information sorely needed. And there’s been more than once, from followup I’ve learned that a very scratchy reading made a very positive difference in someone’s life. I’m grateful and relieved to know that! It balances out the sting, justifies it. But that doesn’t make it feel good at the time. However, I’m far more interested in helping you find your power than helping you feel good in that moment. I know I’m skilled in addressing difficult circumstances. The years I spent working in crisis management, psych, addictions counseling and the like? It was training, for what I’m doing now! My directness is an integral part of who I am, so it only stands to reason it would be part of the right work for me. Anything short would be disingenuous. I’m not big on disingenuous, in case that’s not evident. But that doesn’t mean I don’t feel for you. Far from it! So when I send you that reading that comes across like a knife in the gut, I’m very sorry for the pain. I consider it surgery, not gratuitous emotional violence. But I do understand, it still hurts the same. So please forgive me for my bluntness, understand the intent, and use whatever it is to your best advantage, okay? Use it it heal. You ever get (or give) scratchy readings? How do you deal with it?